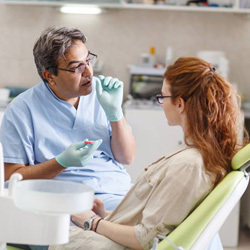 The goal of a good dentist is always to help patients achieve and maintain healthy smiles, but even those patients who are the most dedicated to keeping up with their oral health care routine can experience damage and decay. When this happens, it’s time to contact your Pearland dentist and team at Eco Dental. We are proud to offer a range of dental restoration options that repair damaged teeth to fully functional smiles. It’s always best to get started repairing your smile before any damage or decay can get worse, so please call our team right away. 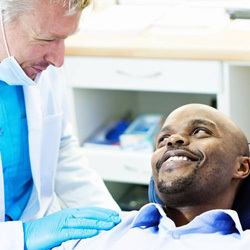 We’ll get started on your personalized treatment plan to renew oral health and function. Traditional dental crowns and bridges are used to repair damaged smiles and replace missing teeth. A crown is a restoration that fits over the top of a tooth. 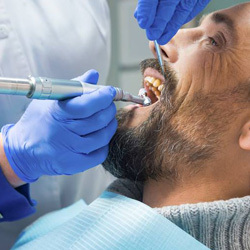 We may recommend a dental crown to repair damage or decay, protect a root canal treated tooth, or even replace missing teeth when affixed to an implant post or used to support a fixed bridge restoration. Fixed bridges are prosthetics that can replace one or several consecutive missing teeth. The replacement tooth or teeth are fused to dental crowns on both sides. The crowns are then attached to healthy teeth on both sides, leaving patients with full, natural smiles. For those patients who want to save a little time and get a high quality dental crown or bridge, we offer same day dental restorations. Using innovative computer assisted design and manufacture technology, we can get your tooth ready, mill a custom dental restoration, and place your crown or bridge in just one trip to the office. Tooth-colored fillings are crafted from a high quality, durable composite resin material. These fillings strengthen the damaged tooth, replace lost structure, and they look just like your healthy, natural smile. Following advanced tooth loss, you may need a partial or full denture. Partials are tooth replacement prosthetics that fill in gaps between healthy teeth. They are held in place with clasps that attach to the remaining teeth. Full dentures replace an entire row of teeth and do not have remaining teeth to provide support. Instead, the denture base is molded for a precise fit. When properly crafted, the denture base creates suction with the gum line, holding your prosthetic smiles firmly in place. When tooth decay or damage reaches the inner layers of the tooth, the pulp, you may need a root canal. The nerve system of the tooth is housed within the pulp, and when it’s accessed by outside elements, the result is severe pain and sensitivity. 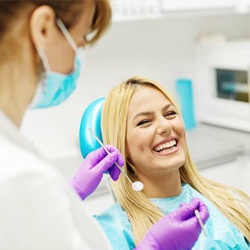 Root canal therapy allows us to remove the pulp and nerve tissue, replace it, and place a protective dental crown to fully restore the form and function of damaged smiles.